TAFADI is the commitment arising from 'taffakur'. True tafadi (fidagiri) is an outcome of the journey which begins at the head (Aql) and reaches the heart. 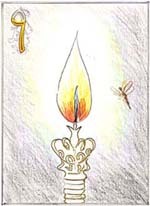 The very first image that comes to one's mind at the mention of unconditional love and sacrifice, is the one of the burning candle and the moth attracted towards it to be engulfed. The image of the a burning candle and the self destructing moth has given rise to whole genre of poems, prose and imagery. TAFADI for mumineen does mean unselfish love and sacrifice for his Moula, but it is as a result of true 'ma'refat' and not under influence of charm and impulse.Romancing has robbed sacrifice of its true meaning,it has got mixed up with with beauty, charm and sensuality. When a mumin does 'tafadi' for his Moula, it is not merely a flutter of the heart, but it is a commitment, which will be tested time and again, it is commitment where one has to make very difficult choices. We need a will as well as an emotion to truly love our Moula.Chivalry in 'tafadi' has nothing do with the sweetness of the appearance or charm. It has everything to do with an awakened mind, and the tenderness of the heart,determined to service. TAFADI means to 'let go and rejoice' here I would like to point out a very subtle difference between 'let go' and 'giving up' We may give up but still regret,but in 'letting go' for your Moula there is no regret but true happiness. There are many examples of mumineen, who at the instance of Aqa Moula (TUS)have 'let go' their lifestyles, their livelihood, their habits, their materialistic attachments, and have found everlasting fulfillment. By 'letting go' you become part of the radiance that is emanating from the flame. There is a difference between the moth being engulfed by the flame, and a mumin being merged with the flame, receiving the radiance. If you go to look at it, the entire cosmos is as a result of sacrifice, which perpetuates all the aspects of life. If you look at the plant and vegetations,we find them harnessing the energy of the sun, and transferring them into fruits, vegetable and cereals for the consumption of humans and animals.Likewise the animals in their turn are sacrificed and domesticated, for the good of humans. It is a long chain of sacrifices made in the cosmos, but in our context, if a mumin does true 'tafadi' for his Moula, within his short life span, he will be emancipated. May Allah grant our beloved Aqa Moula (TUS) sehato-a'afiyat-ta-kiyamat.Ameen.